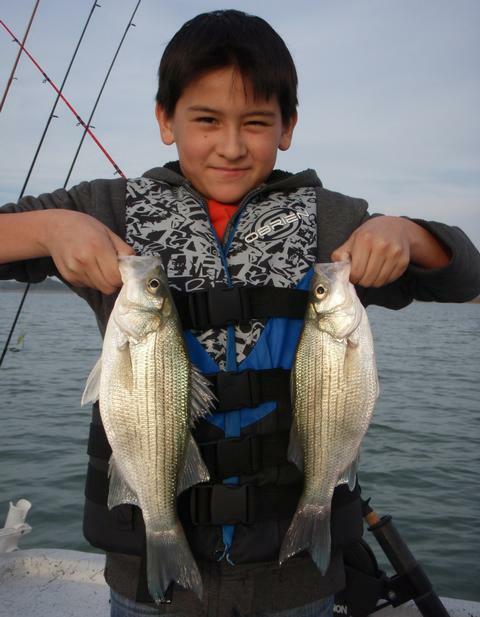 Josh M. called me late last week asking about the possibility of a “Kids Fish, Too!” trip for his son, Cory. Cory is a “nuts-about-fishing” 11 year old who came out with me previously over the summer of 2010. We downrigged for white bass and largemouth bass on that trip and Cory enjoyed himself, but, on this trip he wanted to be more “hands on” than he could be with the downriggers. I let Josh know that my winter fishing trips are nearly 100% vertical jigging and would engage Cory the entire time. We agreed to work a trip in when the weather was just right. Cory worked a mean slab today to put his fair share of exactly 100 fish in the boat just before Texas froze over. Well, today, sooner than expected, the weather was just right. Today was literally the calm before the storm — a balmy 64 degree high with light SSE winds and a bit of humidity and cloud cover, all in advance of a severe arctic cold front now just hours away from central Texas. There is no better setup in the winter than a day with a 14mph or less wind from the S or W just in advance of a cold front. We launched at 2p, and immediately found a fair-sized school of white bass holding just off the river channel in 35-26 feet at Area 186 (BA:9 T). With exactly zero prior experience in vertical jigging, Cory’s fishing savvy shone right through as he matched me fish for fish for the first 25 fish we boated (24 white bass and 1 largemouth). These fish stayed turned on for around 40 minutes and then slacked off, so, we went searching again. Again we found fish in 37-38 feet of water, and again just off the main channel at Area 679. The first 10 fish we boated here were the largest of the trip, each going 13+ inches, with the largest going 13 7/8 inches. These fish were not all that jazzed and therefore it took a little work to get them to bite, but, by the time these fish turned off we’d put another 18 fish in the boat (all white bass). Off again … this time to Area 721 where, in 35 feet of water we encountered another bottom-hugging school also just yards away from the main channel. We pulled 17 fish out of this school before they gave up the ghost (16 white bass and 1 short largemouth). It was now around 5p and their was a noticeable uptick in natural activity. Sensing we’d have a strong pre-sunset feed tonight, I spot-hopped and quickly searched with sonar hoping to find a large congregation of fish ready for one last strong feed before night brought great weather changes. We found such a congregation at Area 103. With exactly 60 fish boated at this time and based on the awesome picture my sonar was painting, I encouraged Cory that, with concentration and attention to detail on his jigging technique, the two of us could definitely land another 40 fish to make it 100 even for this trip, all prior to sunset. He just grinned, and then I knew he was up for the challenge! Things started off well — the fish were active enough to be taken on a smoking retrieve, so, we smoked ’em when we could and jigged ’em when we had to and, by sunset had exactly 99 in the boat, but, the last 2 were spaced well apart and were really tough to goad into biting. Number 100 was going to be a tough one. I put away our slabbing gear and got out the sniping gear. I talked Cory through how to follow his lure on sonar and, by the time our 3rd shot at a suspended white bass came along, Cory had figured things out enough to make some magic happen. We both watched as Cory moved his lure and the fish moved with it until it overtook his lure and his rod tip loaded. Cory pulled up, the hook hit paydirt, we boated the 100th fish of the trip and cheers broke out!! By now we’d worn out our welcome and I knew we’d not catch any more. We loaded up and headed to the dock. The following is a report to the membership of the Austin Fly Fishers and those individuals and companies who support S.K.I.F.F. (Soldiers’ Kids Involved in Fishing Fun). S.K.I.F.F. 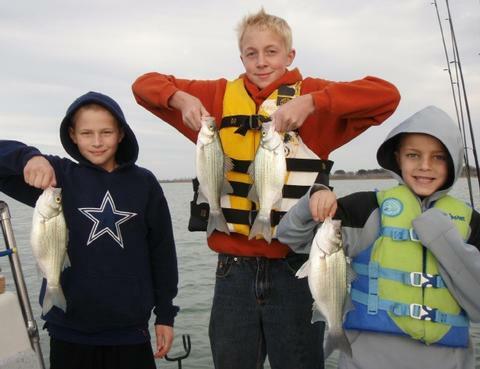 exists to take the children of deployed or deceased soldiers on fishing trips at no charge to the soldiers’ families. I fished two S.K.I.F.F. trips today in an effort to take advantage of the predictably strong pre-frontal bite before thewinds turn northerly and our weather gets cold and wet as is forecast beginning tomorrow. 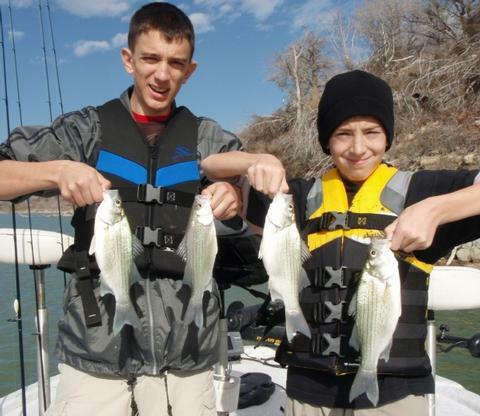 In the morning I fished with Ryne (age 16) and Ty (age 12) Gehring of Harker Heights. Ryne (L) and Ty (R) with 4 of 105 fish we took today under ideal pre-frontal conditions. Both boys are involved in scouting; Ryne just completed his Eagle Scout project and will be awarded that honor soon, and both he and Ty spoke excitedly of the fun they have each year at the local “Trout-O-Ree” event wherein trout are stocked into a pond on Boy Scout property in preparation for a weekend fishing derby. These boys are the sons of First Sergeant and Mrs. Eric Gehring. 1SG Gehring is serving with the 1st Cavalry Division near Tikrit, Iraq. Mrs. Gehring is working towards a degree in social work. The Gehring family learned of S.K.I.F.F. and contacted me about a trip after reading in the Killeen Daily Herald of another S.K.I.F.F. trip that produced a 9.25 pound largemouth back in December. I picked the boys up at their home and we headed to Stillhouse Hollow. We searched with sonar two traditionally productive areas near the old Lampasas River channel and saw little, but then sonar lit up as we looked closely at a third such spot. I threw a buoy on top of these fish and we went to work jigging slab spoons (TNT 180’s in 3/8 and 3/4 oz.) in about 32 feet of water. We stayed on top of these fish located between Areas 103 and 720 for 140 minutes, and over that span of time boated exactly 91 white bass and 1 crappie. At this time the skies, which varied throughout the day from fully clouded to fully clear, cleared and the bite died as the light intensity increased greatly. We headed out to give flatline trolling a try just for variety’s sake, and we found one lone white bass on the “circuit” between Area 343 and 704 — it fell to a bone colored Storm Wiggle Wart. As we trolled, the first wind of the day began to push from the SSW at 12-14. I told the boys that with the return of the wind, the fish activity would pick back up and that I was sure we could break the 100 mark if they were willing to give vertical jigging one more try and really stay focused at it. They were both game for that, so, we headed to Area 718, graphed fish in 35 feet of water, dropped slabs down among them, and pulled up 12 white bass in 15 minutes’ time to end the morning trip with a bag of 105 fish. In the afternoon, I met up with the Salyer boys — Chase, Sean, and Trent, also of Harker Heights. Sean (L), Chase (C), and Trent (R) wore the paint off my slab spoons today — 147 fish taken during a major 3 hour feeding binge. These boys are the sons of Lieutenant Colonel and Mrs. Roy Salyer. LTC Salyer is with the Third Armored Corps (III Corps) headquarters and is stationed in Baghdad, Iraq. Mrs. Salyer is a teacher with the Killeen school district. The timing on this trip turned out to be a blessing to Mrs. Salyer, as she had planned a baby shower for a friend this afternoon and was a bit concerned as to what her 3 young men would be up to during this decidedly feminine event. As it turned out, my phone call offering a fishing trip for the boys took care of those concerns! Grandma Salyer dropped the boys off and picked them up and the shower went off without a hitch. The fishing this afternoon was yet another blessing. I am not exaggerating when I say that no sooner did I arrive at the boat ramp at Stillhouse about 20 minutes in advance of our agreed upon meeting time, than a cloud of terns descended upon a patch of open water near the old Lampasas River channel feeding on the shad being pushed to the surface by hungry white bass beneath. That 20 minute wait for the boys was the longest 20 minutes I’d waited in a long time! I just knew the birds would dissipate or some other boat would pull up under them while I waited on the boys, but, as they arrived at 2:00pm sharp, the birds continue to work. I gave them the world’s fastest safety briefing and life jacket fitting ever witnessed and we tore off after those birds to try to make hay while the sun shone! Well, there was no need to rush, as those birds stayed over an 80 yard stretch of channel for nearly two hours. With the boys’ 3 rods going constantly and me occasionally kicking in a fish of my own, we amassed a catch of 99 fish in the first two hours of the trip. These fish all came off of Area 721. After things got slow here, we just bumped up the channel a ways and got back into the fish at Area 320, putting 34 more fish in the boat, including our trip lunker, a 3.00 pound largemouth brought to net by Chase. After a brief lull from around 4:30 to 5:00, the birds began working once again over Area 722, where we boated a final 14 fish. This afternoon’s trip yielded a total catch of 147 fish (146 white bass and 1 largemouth bass), all of which were taken on TNT 180 slab spoon in both 3/8 oz. (that’s what I used) and 3/4 oz. 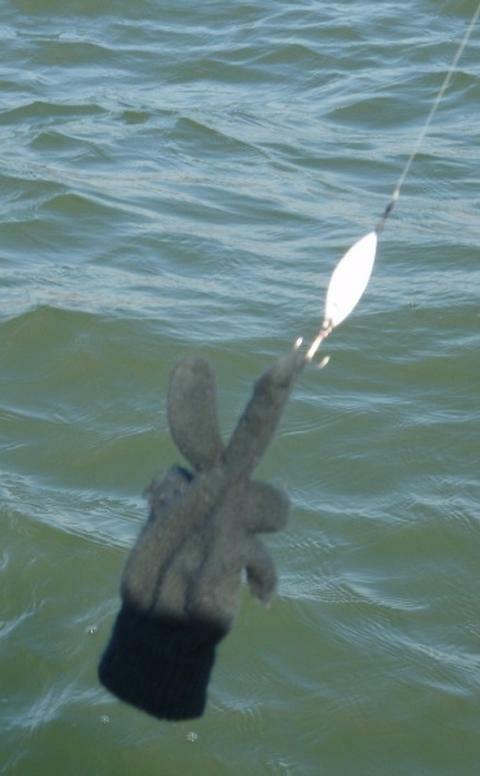 (that’s what the boys used to give them a bit of extra sensation so they could stay in contact with their lure). 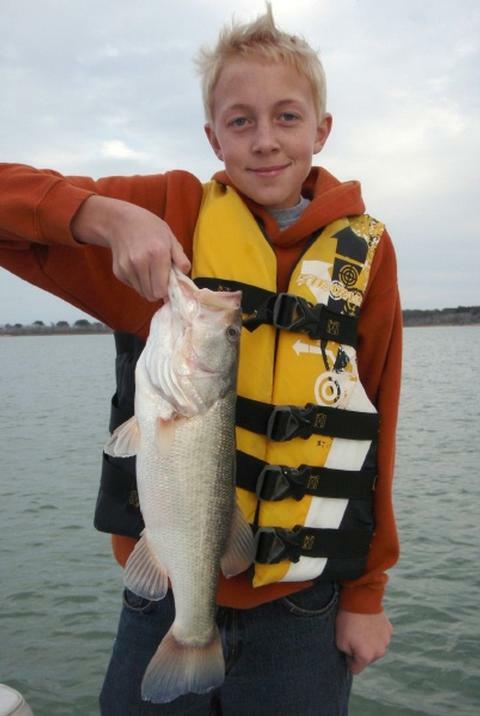 Chase took the largest fish of the day, an 18.75″, 3.00 pound largemouth found mixed in with a school of white bass. With any luck the foul weather forecast for early this coming week will not bring any flooding rains and we’ll get back to fishing after the weather stabilizes. Thank you all so much for allowing magical days like this on the water to become a reality and a memory for our military families!! The following is a report to the membership of the Austin Fly Fishers and others including individuals and companies who support S.K.I.F.F. (Soldiers’ Kids Involved in Fishing Fun). S.K.I.F.F. 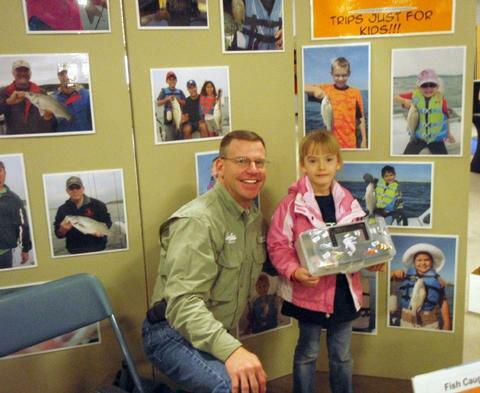 exists to take the children of deployed or deceased soldiers on fishing trips at no charge to the soldiers’ families. 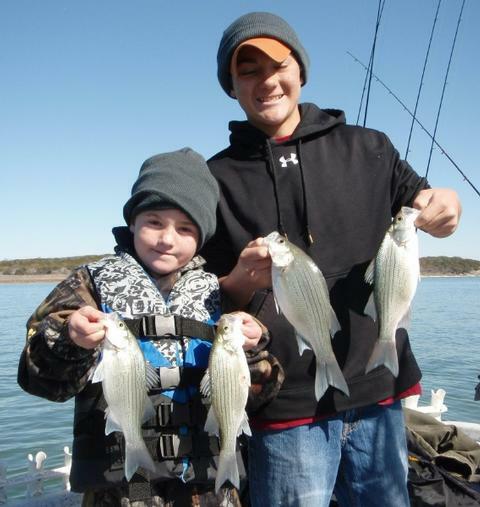 Lane (L) and Landon (R) with a sampling of their catch taken from 49 degree water this morning. 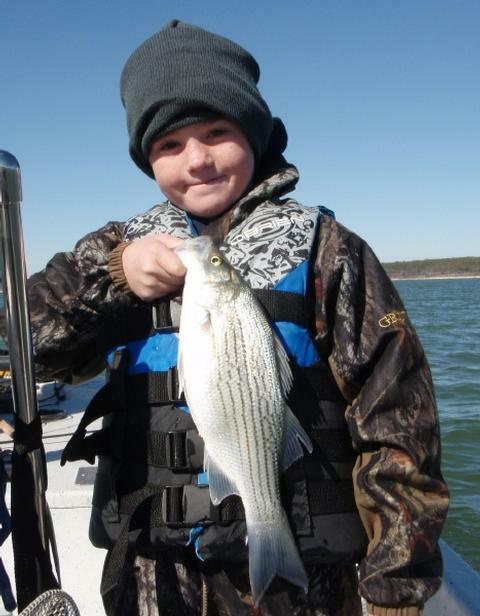 Landon with our largest fish taken today — a hybrid striped bass that went for his TNT 180 slab. Given an ideal weather forecast consisting of SW winds in advance of a rainy cold front due in Sunday, I scheduled 3 S.K.I.F.F. trips over the span of 28-29 January. On this first trip of the three, I was joined by the Robison boys, Lane (12) and Landon (8), of Kempner, TX. The boys’ parents are both lieutentant colonels in the U.S. Army. LTC Scott Robison is currently serving stateside with the Operational Test Command, and LTC Jennifer Robison is based out of Mosul, Iraq, where she commands the 85th CSC Unit which serves soldiers with stress-related psychological challenges. d be catching, the weather conditions, the boat’s layout, and more. It sure is reassuring to know there are some quality young men coming up in this next generation. As we launched and began the search for fish, the forecast we expected was not the one we got. With a nippy 38F air temperature, the 15 mph west wind was already blowing whitecaps before sunrise and put the windchill factor somewhere down lower than we cared to think about. This high wind literally blew away any early morning bird action that might have pointed the way to fish and left us having to search for fish the hard way — with sonar. Long story short, we really struggled until around 10:45, and boated only 3 fish off of Area 174 by that time with the help of a few birds chasing shad pushed toward the surface by white bass and hybrid. Right at 10:45, things took a turn for the better. I idled over a slow upward slope and there at 47-50 feet down was a large, nearly immobile school of white bass holding tight to the bottom. These fish were holding so tight, in fact, that they did not show at all on traditional sonar, but only on my Structure Scan sonar. I quickly got a buoy overboard to mark these fish and we went to work. I tell folks the toughest fish in a school to catch is the first one. Once the first fish is caught, it panics as it is reeled in and will often regurgitate its most recent meal, defecate, and, of course, it flashes and struggles as it fights, putting off flash and vibration. All of these things are very attractive to schoolmates and gets them agitated and more likely to feed. And so it was, I hooked one fish, and the floodgates then opened. The boys boated 38 more fish from that point until a time nearly 75 minutes later when the wind blew itself out and the surface went nearly calm, thus ending the (late) morning feed. For our efforts today we boated a total of 42 fish, including 2 barely short hybrid, 1 drum, and a mix of white bass and immature hybrid striped bass. Every last fish came on either a 3/8 or 3/4 oz. TNT 180 slab. Little did we know we were all in for a treat when, at around 11:30, Lane’s cell phone rang. IT WAS HIS MOM CALLING FROM IRAQ!! Lane gave her a blow-by-blow account of Landon hooking, playing, and landing a nice white bass, and all 3 of us got to speak with her. She was very gracious and thanked me for giving her boys a special day on the water. I promised her digital photos by nightfall. I’m hoping to put 100 kids on the water this year over the span of ~50 trips, and we’re off to a great start!! Thank you for your donations and contributions that make this all possible. On the heels of this morning’s SKIFF trip to Belton, I fished Stillhouse this evening under comparable weather conditions so as to compare and contrast the fishing. Weather tomorrow is forecast to be excellent and I’ve booked two SKIFF trips for 5 young men, so, I wanted to get them on the best fishing I could. In summary, I caught more fish in a shorter period of time on Stillhouse, and the fish had a “feel” to them that made me confident the action would be reliable at least until the next significant weather change. I fished only 2 areas this evening — Areas 718 and 719. At Area 718, I found fish right on the high edge of the break and very eager to feed. When I first got a slab down to them they were willing to pop the larger 3/4 oz. lure; after they settled down the 3/8 oz. did the trick. I boated a total of 34 fish here prior to sunset. The bite died about 20 minute before sundown. I took 32 fish off this area. At Area 719, the fish fed for an unusually long time beyond sunset. I used a sniping technique here targeting white bass that were suspended at 20 feet deep and shallower over this 34 foot bottom. I find that the later and darker it gets, the more likely the still-active fish are to be nearer the surface. I boated 12 fish in this vicinity. I fished my first trip on Stillhouse in this new year today and was pleased to find fish in their traditional modes for this season and water temperature. I waited for the wind to pick up before heading out today and, once on the water, had a nice 14 mph S. wind to work with. I found two distinct groups of fish today, both on topographic features adjacent to deep water. The first concentration of fish appeared at Area 716. These fish were over 38-40 feet of water and were suspended 20-32 feet down and were relating to sluggish schools of shad in this same area. These fish were ripe for picking with a “sniping” technique using a Rapala Jigging Shad Rap and, indeed, 14 fish fell to this approach with 3 more briefly hooked and lost. This action lasted about 45 minutes, from 3:15 until around 4:00pm. Next, I headed out looking in areas with similar features and found fish, this time near bottom, at between Area 103 and 549 in 27-31 feet of water. Here again there were lots of sluggish, nearly immobile, schools of shad. These fish were really turned on at this point allowing me to boat 20 additional fish between 4:30 and 5:00 pm, all on a TNT 180 slab in 3/8 oz. I experimented today with a new braid product sent to me by Sufix — it’s called Sufix 832. Honestly, I’m not a real fan of braid, but this is the best I’ve used so far in that it is much smoother than average braid and doesn’t feel like you’re trying to reel a bandsaw blade through your rod guides. All the sensitivity and thin diameter of braid is there — just more to experiment with as the year goes by!! The bite went soft right at 5:08pm. I found no helpful bird activity whatsoever on this trip. Today was my first fishing trip of the new year. I had the boat in for some end-of-season fiberglass work, a booth at the Central Texas Boat Show, and a string of 2 weeks of nasty, cold weather, so, it was good be back at it once and for all today. Joseph with one of two just-short hybrid he landed today. Today I fished with a young man, Joseph H., from my church. Joseph faced some tragic events in his life over the holidays and needed some “guy time”, so, we spent the day together getting to fish a lot and talk a little, and that worked out well. I’ve noted many times in my blogging that foggy conditions NEVER provide for good fishing, and today was no exception. We moved our start time back to avoid the thickest of the fog, but, what fog remained still put a damper on the fish action until it lifted. The statistics tell the story … we boated 26 fish from 9:30 to 1:30 (4 hours) under cover of fog and never saw any useful bird action during this time. From 1:30 to 5:00 (3 1/2 hours), we boated 49 fish and had birds providing helpful cues for a solid 40 minute span during this time. We boated fish today as follows: at Area 593/132 — only 2 white bass and 2 drum; at Area 355/083 on the 38 foot contour — 22 fish, all whites and juvenile hybrid; at Area 098 — 10 fish, all white bass; at Area 081/715 — 4 just-short hybrid, 2 blacks, and 6 white bass, all under birds in 36-38 feet as well as 1 hybrid and 1 black downrigging in this vicinity, and at Area 714 — 25 fish, a mix of white bass and juvenile hybrid. Except for the 2 downrigged fish, all others were taken on either a 3/8 or 3/4 oz. TNT 180 slab. Fish went only for a jigged slab or an eased slab today — smoking them was a no go. … that’s pretty quick thinking for a 6th grader! The fishing really tapered off around 4:10 and by 5:05, just shy of sunset with no promising bird action gathering, we headed for home. Wind: Winds were SE3-4 with a heavy fog early, gradually clearing by 1:00p. Skies: Fog in the AM; partly cloudy and clearing in the afternoon. BOAT SHOW WAS A BLAST!! I thoroughly enjoyed the Boat Show this year. Yes, it was a bit smaller than in years past and that reflects the blow our economy has been dealt, but I got to catch up with some old friends and make some new ones and that made it all worth it. This photo is of Miss Angelina M. This young lady has great timing! She was a few yards away from my booth when I gave out our last free wristband for kids. She’s so cute, I couldn’t stand to send her away empty handed, so, I presented her with the little tackle box that we had the free wristbands displayed in!! Not 10 minutes later she returned and proudly showed me how she had decorated the box with decals — so we did this pose to display her handiwork. I’d like to thank Dave Hill of the Austin Fly Fishers for taking 8 hours out of his life to help me man the booth on opening day. He hand carried 215 silicone wristbands from Austin intended as giveaways for children advertising the SKIFF (Soldiers’ Kids Involved in Fishing Fun) Program. Those vanished by mid-afternoon on Saturday. My boat is due out of the shop this Friday (did some fiberglass work on her bottom and prettied her up a little for the season ahead) so I’ll be back on the water and looking forward to some winter “sniping” given this extended cold snap. 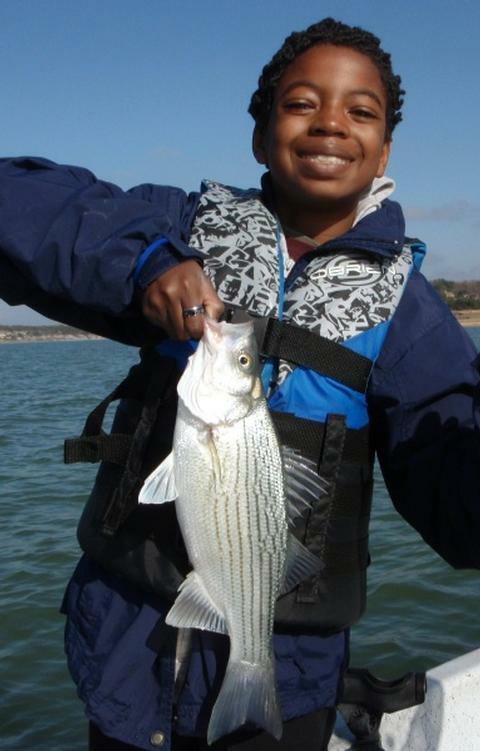 Sniping is like icefishing on open water, making extensive use of sonar combined with very exact boat control to target deep, suspended fish — both white bass and hybrid stripers. I do fish year ’round and the winter months offer some of the best fishing of the year — plenty of birds to point the way to the fish, no boat traffic, no heat, no mosquitoes … what more could you ask for! Of course I watch the weather and hand-pick days with the right combination of wind and sky conditions to ensure success. If you’re thinking about a winter trip, be as flexible as you can in identifying potential dates before you call or e-mail so that we can choose the best conditions for your trip. I wanted to let you know that I’ll once again have a booth set up at the Central Texas Boat Show inside the Bell Co. Expo Center this coming Fri., Sat. and Sun. I’ll have all the lures that I always use and write about rigged up for “show and tell”. I’ll have some new stuff that Rapala sent along, and I’ll have plenty of freshly tied “Hazy Eye Shad” tandem rigs for sale. Please stop by, introduce yourself and let’s talk fishing!! Friday is Military Appreciation Night so all active duty and dependents get in free. THIS IS A GREAT TIME TO SIGN UP FOR A FREE SKIFF TRIP if you’re a soldier or spouse of a soldier who is or will be deploying soon.